Shameless and Hungry: My Musician of the month! My bestie Beatle George Harrison aside, Ringo Starr is my Musician-of-the-month.. The way he played the drums throughout Tomorrow Never Knows (from the album Revolver) is just amazing! This is my crayon drawing of the Beatles' legend.. The best thing about Ringo is his casual and cool persona in the Beatles.. While George was the quiet one, John the thinking one, Paul the good-looking one, Ringo will then be the goofy one.. Although he always has supported the popular 60s' catchphrase 'Love and Peace' Ringo himself was never much deep as compared to Lennon's acrid wit! Ringo was the funny one. 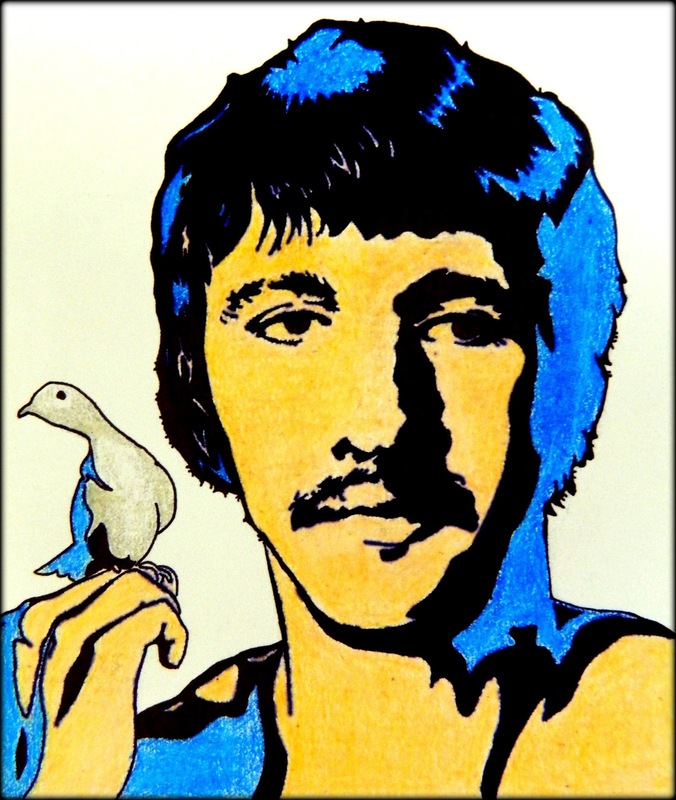 The man brought a down-to-Earth appeal to the band and it definitely helped a lot to the public acceptance of the band.. the friendly one, whom all the grandmas and the children love..
Ringo was a musician before he became a Beatle. He was a drummer before the Fab Four and is still a drummer in his latest incarnation as the All Starr Band. Apart from being a drummer, Ringo has sung a couple of songs for Beatles too, like With A Little Help From My Friends and the Yellow Submarine.. There is no denying that its a common mistake people make, when they fail to register Ringo as one of the last Beatles. Sir Paul may have been more associated with the Fabs, but the contribution of Ringo is definitely unquestionable..
And what more do you have to say for a man who has a Bond Girl for a wife? Ringo Starr, the ex-Beatles' drummer is my Musician of the Month..